Moped & Scooter Insurance for the young. Moped or Scooter Insurance in Spain suitable for our children that were permitted to ride the 50cc versions from the early age of 14, was always a challenge. Most of the 50cc Mopeds and Scooters were then unrestricted and often larger piston sizes were fitted to provide increased speed and acceleration, yet still appear to be the standard Scooter or Moped from a visual perspective. Due to many fatal accidents and the fact that they could be ridden without first obtaining any road sense or taking any practical tests, the laws were recently changed and the legal age raised to 16. First time applicants now have to undergo a series of practical and theoretical tests before they can take to the road. Spanish towns are inundated with thousands of Mopeds and Scooters which can often be extremely noisy, polluting and dangerous to normal road users. Approved crash helmets are compulsory and must be worn at all times. Drivers can be fined up to 100.00€ for not doing so. Dipped headlight beams on Scooters (not Mopeds) are required at all times. Children under the age of 7 are not permitted on the back of a moped. If older than 7 years they must have written permission to be a passenger with anyone driving other than a parent. Motorcycles and Mopeds are required to have a minimal third party insurance policy and many insurance companies in Spain will not offer any other form of insurance for Scooters and Mopeds. Theft insurance for Mopeds and Scooters of 80cc and below is not common. Motorcycles over 80cc can obtain third party only, third party, fire and theft, and fully comprehensive insurance provided the Motorcycle is not more than 10 years old and it carries a current vehicle inspection certificate (ITV), similar to an MOT. From September 2010 the law changed to ensure that anyone wanting to drive a Moped, Quad or Scooter of up to 50cc needs to be at least 15 years old and must take a theory test and a closed circuit test to obtain the AM Licence. The engine capacity cannot exceed 50cc with a maximum speed of 45kmph. Most new 50cc Scooters have been restricted to 45kmph. However, the restrictor (often found in the exhaust) is often removed at the request of the buyer. Take care when purchasing a second hand scooter as it is likely to have had the restrictor removed. Replacing the exhaust is usually necessary to then pass an ITV. To drive Motorcycles or Scooters up to 125cc, drivers must be at least 16 years old, take a theory test, a closed circuit test and an open road test. This is classified as the A1 licence. A ‘B’ licence is a car licence. If you have held a car licence for a minimum of 3 years the A1 licence is included in this category. They have issued a new A2 Licence category. You will need to be at least 18 years old and have held an A1 licence for a minimum of 2 years or a B licence for 3 years and be at least 21 years old. With this licence you can then progress to driving motorcycles of 35kw, approximately 500cc, after undertaking a theory test, closed circuit test and an open road test. Once you have held the A2 licence for a minimum of 2 years and you are at least 20 years old, you can apply to take the A licence test, the theory, closed circuit and open road test, that allows you to ride anything on two wheels as far as motorcycles and scooters are concerned and of any cubic capacity. If you have a United Kingdom driving licence you will first need to convert this to a Spanish driving licence, to enable you to take the A2 licence. This entails an off road practical test, a theory test and an on road driving test. This will then allow you to drive a motorcycle up to the regulated 500cc or 35kw capacity. These are becoming very popular in Spain and many are now being used by hire companies to rent to tourists. These are dangerous vehicles on Spanish roads and many people are killed, seriously injured and maimed. Please check your insurance policy if you are hiring these vehicles in Spain as most are third party only cover with no medical or accident liability should you be unfortunate enough to have an accident. A car licence is sufficient to drive a Quad of up to 30hp as long as it does not weigh more than 550kg and has the normal black and white Spanish number plate. If the Quad has a red and white number plate it is classified as an agricultural vehicle and you can ride any engine capacity. These are also classified as single occupancy and must have a 45kmph sticker pertaining to its maximum speed on the roads. Many young and old Motorcross and Enduro riders proliferate the Spanish roads. There are many privately run Motorcross and Enduro tracks all over Spain and many riders go to circuits at the weekends. Many circuits are open during the week and are relatively inexpensive, depending upon the track. Unregistered motorcross Motorcycles can be used on these tracks but not on the roads, so you will see many of them being trailered to the circuits. 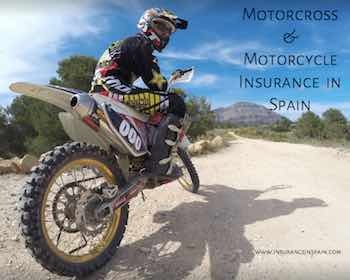 riders do require insurance and can often obtain this through the motorcross federation of Spain. Road and street legal Motorcross bikes are plentiful and most Expats opt for buying Motorcross or Enduro bikes that they can use on the road. These tend to be a little more expensive to buy due to the requirements of registration and the transfer of documentation and ownership during the purchase process. There are a number of motorcross organisations around the country that can supply you with all the relevent information you need to safely buy and use these vehicles. www.insuranceinspain.com can provide a personal accident and injury policy to cover you for any unforseen injury. Most tracks will require that you have an insurance in place before they will allow you to use these tracks. This information is for guidance only as some of the Autonomous regions have their own, separate rules and regulations although they are supposed to be the same. It is best to check what you need, as far as licences and regulations are concerned, with a local town hall or your local police station or vehicle driving test centre. As with all vehicle in Spain you must carry your vehicle log book, ITV certificate, driving licence, Insurance and identification (passport or NIE number) with you at all times. British registered Motorcycles, Scooters and Mopeds are usually insured in their country of origin but they can also be insured in Spain. www.insuranceinspain.com can provide independent cover and resources for insurance purposes so please contact us for your specific requirements.